ALBANY – Jo Anne Dollard, 89, of Albany, passed away on Tuesday, November 27, 2018 at the Teresian House with her family by her side. Jo Anne was born in Albany, the daughter of the late Edmund P. Burke and Helen Hans Burke. She lived here nearly all her life, and was a graduate of Vincentian Institute. She worked in New York City for a time as a hat model, and sang in the Albany area with a quartet know as The Headliners. She was employed by the New York Telephone Co. and by the Albany Board of Realtors. She grew up spending summers at Lake George, and continued her love for the lake all her life. She also loved reading and crossword puzzles, and was a fan of the New York Yankees and Knicks. 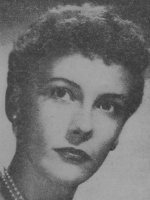 Jo Anne was predeceased by her husband D. Kerry Dollard. She is survived by her children Rosali Lungreen of Albany, Kevin Dollard (Denise) of Hopewell Junction, Ann Walker (Lawrence) of Albany, Timothy Hans Dollard of Albany, Thomas Dollard (Catherine) of Albany, Christopher Dollard (Lisa) of Saratoga Springs, and Ellen Recher (Walter) of Carmel; her brothers Theodore A. Burke (Joan) of Loudonville, and Thomas A. Burke (Patricia) of Lake George; her sister in law Mary Flahive Burke of Albany; her grandchildren Kimberly Smith, Elizabeth King, Leigh Dollard, Kerry, Peter, Nicholas, and Thomas Walker, David and Leah Dollard, Maggie Davis, Brian and Mary Rose Dollard, Kate and Claire Budzinski, and Jack Recher; her great grandchildren Taylor and Noah Brown, Jeremy Smith, and Peter Jr., Miles, Simon, and Elora Walker. She was predeceased by her brothers Patrick J. Burke and Edmund P. Burke. A Mass of Christian Burial will be celebrated Friday morning, at 9:00 a.m. in All Saints Catholic Church, 16 Homestead St. (behind CVS), Albany. Relatives and friends are invited, and may call at the Hans Funeral Home, 1088 Western Ave., Albany on Thursday from 4-7 p.m. Interment will be privately at a later date in St. Agnes Cemetery, Menands. To leave a message of condolence for the family or obtain directions to the funeral home, please visit www.HansFuneralHome.com. Jo Anne “Gran” Dollard will be missed. Love and thoughts to all of her family and friends. Those we hold dear never truly leave us. They live on in the kindness they showed, the comfort they shared and the love they brought into our lives. Please accept my sincere condolences and my thoughts and prayers go out to you and all your family. Sincere condolences to Jo Anne’s children! Have many fond memories of playing with Jo Anne when we were growing up together on Buchanan Street in Albany!